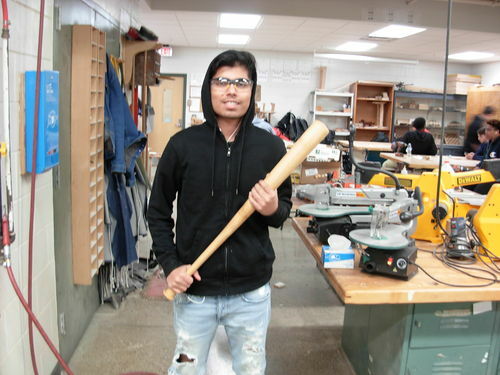 Today I remembered to bring my camera to school to show two of the students who made ash baseball bats in shop class. Hoosay made his as a third lathe project and Athena made hers as a first time turner. I would like to thank LJ Kposty ( Thanks Ken!!!!!!) for supplying the ash blanks from his sawmill. Quality looking bats Jim. You must be teaching them right. I have to give them a lot of credit for such a great job. I hope you have them sign it. Nothing makes a kid prouder than to complete a project and get their picture taken by the teacher! Great job on the bat project! I’m sure this is a special moment for these youngsters. Memories like this will never be forgotten. Even at 72 I remember my high school shop days. Teachers are a special part of a child’s life. Well done bats. I read where they cost more than $100 these days, so a great project to do. Yea to these comments! Great Projects! I also see a scrollsaw; great small shop tool. If you are patient enough; you can do a lot more with the scrollsaw than many people think it will do! I’ve still got a stool I build with hand tools in around 1956, school shop. Looks like they’re going to have a Ball! 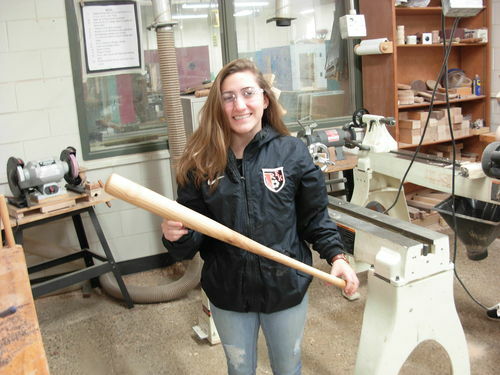 Well done…..I love to see kids getting involved in woodworking. Jim, a great starting project for the young ones. Thanks Jim for making a difference ! Thank you all for the nice comments. They enjoy turning once they get used to what the can do on the lathe. I tell them it is the most fun machine in the shop. A special thanks to you, Ken. The wood they were making them out of was just for looks and not strong like these. One student has a 3rd started yesterday. I can’t be there any more this week so Athena will guide him! ps. I can’t be there because I have bowl order that I need to get roughed out. I just rough turned 19 bowls on the outside and have to turn the inside yet before burying them in chips for 4 months! Thanks, Mike. I’m very proud of them, too! !